With scents rivaled only by a trip to the salon and all natural, non complicated ingredients, LoulouBelle London's boutique aromatherapy treatments, are a new range of skin and beauty products that promise to rejuvenate your skin - without the unnecessary use of modern chemicals. Not only does the brand look delicious but the companies philosophy is one you can't help but agree with: nothing tested on animals, using only materials our skin needs to flourish - whatever your skin type. With natural, recognisable ingredients all detailed, rather helpfully, here on the LouLouBelle London website. I tried the skin care solutions for combination skin; having split personality skin myself, over the course of last week and was not disappointed. The products I trialed were the Lavender & Lemon Rebalancing Cleanser, Mandarin Rebalancing Moisturiser & Geranium & Grapefruit Rebalancing Toner - all of which smelt as good as they sound. The smell is the first thing you'll notice and, if you're anything like me, should have you hooked instantly. Before even opening the bottle, the natural aromatherapy oils used in all of LouLouBelle London's products create a relaxing atmosphere - making it easy to imagine yourself in your happy place while giving your skin some TLC. With LouLouBelle London following your usual cleanse, tone & moisturise routine becomes something to actually look forward to at the end of a long day. Starting with the Lavender & Lemon Rebalancing Cleanser I was instantly impressed by how luxuriously creamy the product was. It's still light and gentle, leaving the skin feeling fresh and soft but, unlike foaming cleansers, it won't strip your skin of essential oils. The thickness of the Lavender & Lemon Rebalancing Cleanser is complimented perfectly by the Geranium & Grapefruit Rebalancing Toner which is silky smooth - you only need the smallest amount to really rehydrate your skin and once topped with the rich Mandarin Rebalancing Moisturiser, my skin was shiny smooth and baby soft. Whats more, I smelt sensational. The moisturiser was definitely my favourite product - due to it's versatility and cooling, soothing texture. I kept the travel sized Calendula Purifying Moisturiser in my handbag throughout the week to keep my skin feeling bright and loved how easy it was to apply on the go. All of the products I used; as well as options for Dry & Oily/Problem skin, are available in miniature travel sets as well as the larger range. I'll be taking some more of the travel sizes abroad with me when I zip off to relax in Spain next week and I look forward to pampering like a pro. After using LouLouBelle London's combination range for a week and also applying their oily/problem skin moisturiser on the go my skin looks recharged and vibrant. 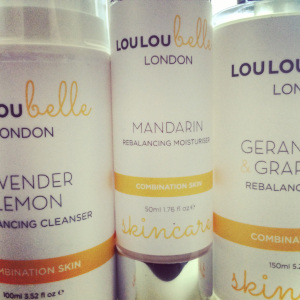 The natural products in LouLouBelle London's range not only leave the skin smelling great (as I may have mentioned) but also purify gently. Unlike many other brands I've tried before, which can strip skin of its protective layers; leaving it irritated and sore. Shop LouLouBelle London now for 10% of your first order using the code: NEWCUSTOMER10, at checkout or head on over to the blog to find out more.